Most, if not all, forms of yoga help alleviate stress-related depression. Stress and depression often occur together during these times of information overload. There are more daily demands upon us than we are reasonably equipped to handle. Yoga for depression is particularly effective when it is practiced prior to a meditation or mindfulness practice. Yoga practice gets us out of our heads as we shift our focus onto our bodies. Ayurvedic herbal tablets can also be combined with yoga to bring another layer of defense to help you overcome depression–naturally (see below). The physical aspects of Kundalini yoga (asanas or postures) prepares us for a deeper meditation experience where the real healing work begins. Kundalini yoga and meditation has the yoga technology that is highly effective of reducing stress and stress-related depression. This is partially because of the balancing effect that breath work (pranayam), kriyas (set of exercises or asanas), and meditation has on your autonomic nervous system (ANS). 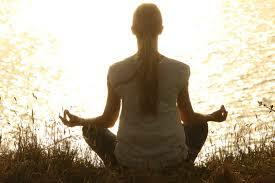 The fight/flight/freeze response from chronic stress is quelled with the calming influences on the rest/digest system. When the ANS is not creating havoc by trying to avoid dangers that are typically based in fear (stress) your mind-body can conserve energy and circulate the feel good hormones. Kundalini Yoga for Depression is an outstanding choice because it has the technology that targets conditions such as stress, depression, and anxiety. A regular yoga practice helps you learn how to respond to stress on and off the mat. How Does Kundalini Yoga for Depression Work? When you practice Kundalini Yoga, pranayam, and meditation, the vagus nerve (the nerve of compassion) gets stimulated. When this happens, the rest and digest portion (parasympathetic) portion of your nervous system engages and counter acts stress in your body and mind. “Medical science says the vagus nerve is important. Yoga says it is very important” –Yogi Bhajan. The vagus nerve “wanders” (vagus, Latin for wander) through the body and affects all major organs and their functioning. It is the second largest nerve in the body, second only to the spinal cord. Originating deep within the brain, the vagus nerve wanders through the neck, affecting speech, voice, continues through the thorax affecting all the organs of the body, and continues to the pelvic floor. Ancient yogic technology recognized the power of the Vagus Nerve, the “Central Tuning String of the Body,” and the power of the autonomic nervous system. By strengthening the nervous system, the hormonal system follows suit and one gets into the zone of healing and peace known as shuniya (the zero point). How Do I Know if a Yoga and Meditation is Helping My Stress Levels? In the Harvard Mental Health Letter, an article entitled: Yoga for anxiety and depression: Research suggests that this practice modulates the stress response concluded that yoga appears to modulate stress response systems. The stress response is primarily modulated by balancing the autonomic nervous system. Stress levels, which often cycles into stress related depression, can be monitored using heart rate variability biofeedback (HRV) and hormone testing. HRV biofeedback can be done at home and is non-invasive, whereas hormone testing requires blood work. So for most people interested in tracking their progress, HRV biofeedback is a good choice. HRV biofeedback is optimal, however it is a good option for many Western minds that need validation that a meditation is working. Keep in mind that meditation requires ongoing practice to achieve sustained results. As you continue to practice your baseline will go up making you more resilient to stress as it happens in the moment. That is why a short daily yoga & meditation practice is preferred over a once a week class. Think of your practice as a “vitamin against stress” taken daily. Everyone’s busy, start with 11 minutes a day and go from there. The following Youtube is a full length Kundalini Yoga class, which includes pranayam, kriya (exercises), and meditation. This breath work meditation or pranayam is excellent to help you increase the flow of energy that has been hampered by depression. With regular practice, you will feel lighter, younger, and more intuitive. Kundalini kriyas (physical exercises & postures) prepare you to go deeply into the meditation that follows towards the end of the class. Allow the yoga to meet you where you’re at and don’t over extend. Originally taught on October 17, 2000 by Yogi Bhajan. Cold Depression is marked by numbness and being out of touch with your soul. Although nothing may be wrong, there is a feeling of isolation and dis-connection from the core of who you are. Yogi Bhajan gave us this meditation to help us reconnect to our souls, and to become more immune to the Cold Depression of our times. Tune In: Ong Namo, Guru Dev Namo (chanted three times). Body Posture: Sit in easy pose, in a chair, or bed; maintain a straight spine. Apply a light jalandhar bandh (tilt chin downward). Mudra (Hand Position): Interlace your fingers so that the finger tips press into the cavities between the fingers on the back of each hand. The index fingers are straight up, pressed together along their length. Thumbs cross each other comfortably. Hands are held at chest level. Eye Focus (Dhrist): Eyes are open, focused at the tip of the nose. Mantra: Chant “Wahe Guru (3 times) followed by Wahe Jio” (one time) from your navel point. At the sound of Wha focus at the navel point; Hey focus at the chest; Gu (goo) focus at the lips. Follow the same sequence and rhythm for Wahe Jio (Gee-oh). End: Inhale deeply, hold the breath for 3-10 seconds (based on your lung capacity), and exhale completely. Repeat two more times. Relax. 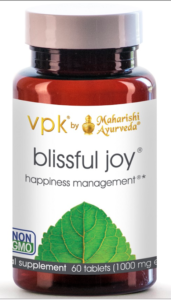 Blissful Joy is a tried and true Indian family formula that combines ashwagandha with other synergistic herbs to provide an effective supplement to lift your sense of well-being naturally. The above description is not intended to be a substitute for medical advice. Check with your healthcare practitioner prior to any exercise program or before you begin taking herbal supplement. Any links on this page may be affiliate marketing links, which means that if you purchase through a link howtorelievestressnaturally.com receives a small commission. The price is the same to you regardless.